This is Molly. Molly is a Rusty daughter. She is a full sibling to our Lady dog. Pictured here at 1 year old. I just wanted to share some photos and tell you how much we love this little girl. In just a few simultaneously-short-and-long months, she has absolutely captured Jon’s and my hearts. She’s loving, sweet, and a huge goofball and we couldn’t imagine life without her. She’s absolutely the most popular being (human or canine) in our apartment complex. I’m sure more people greet her by name than either Jon or me! This is a Rusty x Boo boy. Pictured here around 1 year old. His owner writes that "Potato" is a big boy. He has been easy to train and has a great temperament. He enjoys traveling in the car and to new hotels, playing fetch, and loves the water! This is Lucy, she is a puppy of Rusty and Roux, born November 2017. Lucy has been the best companion I could have ever hoped for. She has been so well behaved, easily trained, and has the sweetest demeanor. She can spend an entire day skiing the backcountry or be perfectly content just cuddled up on the couch. She travels all over the country with me for work, and is the perfect field dog. I can't say enough positive things about her and the Lish Kennels experience overall! Thank you for giving me such a wonderful pal! Our boy has been an incredible part of our life. He is best friends with our little son and goes to work out in the field. He even took a 50 mile backpacking trip and scared away an inquisitive black bear to protect his family. He is the perfect balance of field and house dog. He loves people and goes insane when I pull the decoys out for training time. Kym was informative with continued updates and pictures when he was a small puppy. I’m happy to be a part of the Lish Kennel Family. Just wanted to send you a photo of True. He is just a spectacular dog. He's got the heart of a lion, but so sweet. Hi Kym, here are some pictures. He loves the water and swims right along with the other two. He is very easy to train and has a happy disposition. We love the way he uses his nose already and is watching birds. He is the best puppy we have had. I would recommend Lish Kennels strongly. "Thor is a joy. 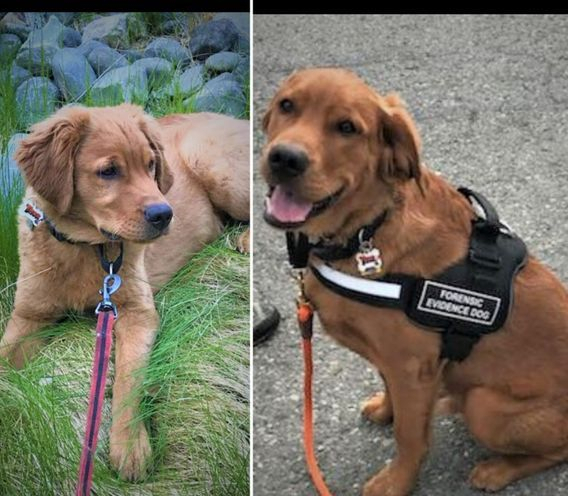 A master canine search dog trainer says he has incredible drive and intelligence for search and recovery work. He’s sweet and rambunctious and we love him." Here are some pictures of pink collar girl from Rusty and Roux! She is doubling in size everyday! 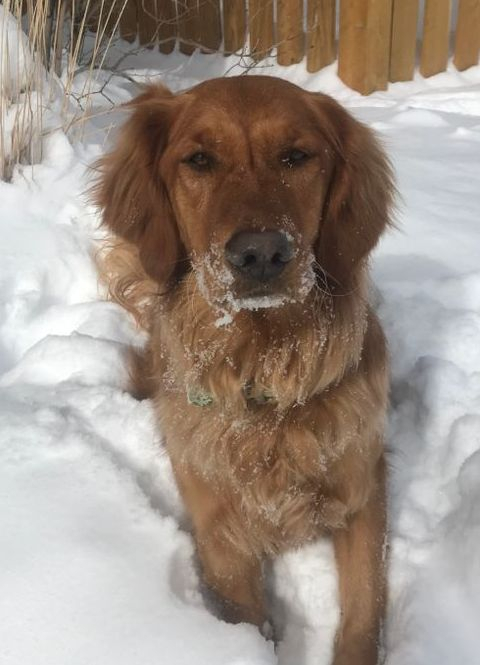 I named her Lexi and I love her very much:) She loves all the snow here in Montana. Lexi pictured here at nearly 4 months old. Copper is the best dog I have ever owned! He is a great family dog, a horn hunting machine, and so awesome at bringing in our ducks and geese. Kym has the cleanest facility. I lived by her for several years and she was outside several times a day cleaning up after her dogs and working with them. Great neighbor and loves her animals! Murphy is a wonderful addition to our family! Working with Kym was an absolute pleasure and she made the entire process so easy. Receiving weekly photos and updates was very nice as well. Kym was really patient with me and took the time to explain whenever necessary. Murphy flew to us in NJ and has been attached to me since. He is eager to learn and please, loves people (especially kids), and gets along great with other dogs. He is a very fast learning - house trained within 2 weeks and learned commands quickly. The vet was also extremely impressed with everything about him (features, color, build, etc). 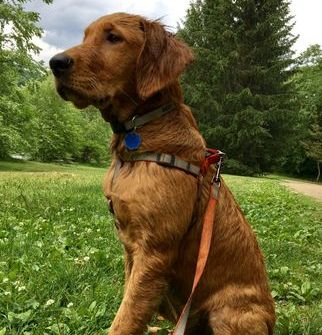 Murphy is now five and half months old and turns heads and brings happiness to everyone he meets. He is a great family companion. I highly recommend Lish Kennels and wouldn't go anywhere else for a another golden pup in the future. Thank you so much for what you do Kym! After much research and discussion, we found Lish Kennels to be the very best choice. Kym is simply amazing to work with and her dogs are the best of the best. She is great about communication and frequent updates of the puppies with both pictures and information. We went to pick our pup and it took us over an hour to decide (all the puppies were great!) Kym was extremely patient, understanding, and encouraging. We could not be happier with our decision; Riley is the best addition to our family. 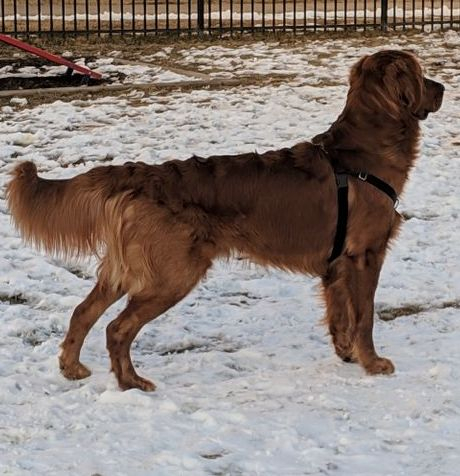 He is absolutely beautiful, is well-mannered, is great with kids, other dogs, and adults, and has a very calm disposition. 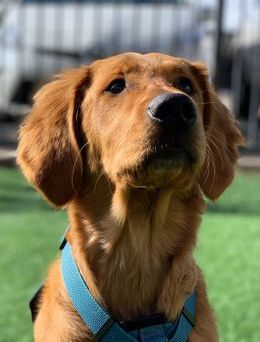 He has also been the absolute easiest dog to train: he learned and perfected over 9 commands before he was ten weeks old! We couldn't have had a better experience anywhere else and will definitely purchase another golden from her when we are ready. I would highly recommend Lish Kennels to anyone interested in the perfect companion. Thank you Lish Kennels for the awesome service you provide for your customers! Hi kym!!! Just wanted to send you this awesome picture of fin from the other day. He is by far the most amazing dog! 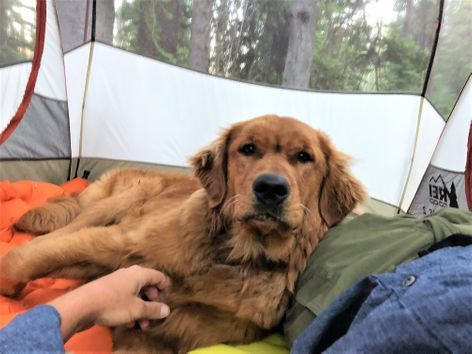 He hikes, skis, fishes, and does everything with us... He is always by our side! Absolutely the most loyal dog we have ever been around. My parents who have owned goldens for forty years couldn't get over his achievement. He is simply our heart and soul. Thank you so much! 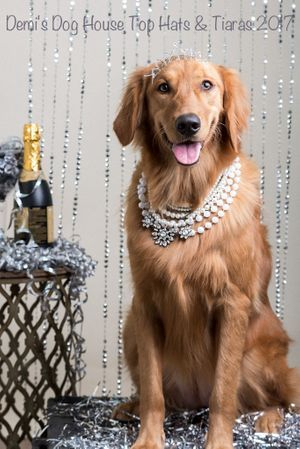 We picked up Lucy, our Golden Retriever, from Kym Lish at Lish Kennels in December of 2015. She immediately became a loving family member, getting along great with kids, adults, and Dexter our 1 year old Shorkie. Lucy is a very smart dog which has made training much easier. We are very excited for hunting season this year with the instincts Lucy has displayed, and the nose for birds that she has. I would just like to thank Kym for making getting a new hunting dog/family companion such an easy and comfortable process. We got our GSP Wilson from Kym back in January and couldn't be any happier. He is a very smart little boy who catches on quickly and has shown natural hunting abilities. He's a healthy, happy, funny little sassy dog and we can't say enough good things about Kym and Lish kennels. Kym was extremely helpful throughout the whole process and provided great advice. Also thanks to her little girls giving so much love to our pup he is the biggest sweetheart/ cuddler. Hello, Kym! We had a very good trip back to Harper. From your place to within 12 miles of Harper, Sluice whined for maybe a total of one minute. We had stopped so she could stretch and at every stop she did pee. For the last 12 miles she decided there needed to be more out of life than riding in a crate, in a truck. I am glad she gave it as much time as she did before coming to that conclusion. In my mind I was going to give it at least a week to gradually introduce her to Ingle and Rookie. Amazingly it took about 20 minutes and she was "in" with both adults & everyone was acting like, "What's the big deal? We do this all the time". They are so gentle with her when they play, and they DO play. I am not sure that Sluice see herself as a little dog. She had no hesitation to engage with either dog. Her weight is exactly where it is supposed to be when following a slow growth program. She is quite the girl and her personality is a joy. Thank you again, Kym, for everything!!! 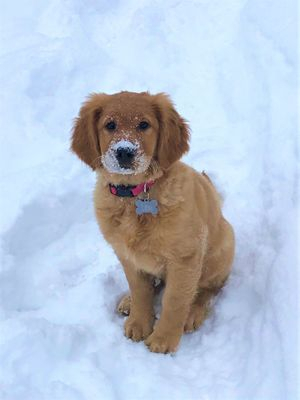 We got our female Golden Retriever puppy just one week ago. 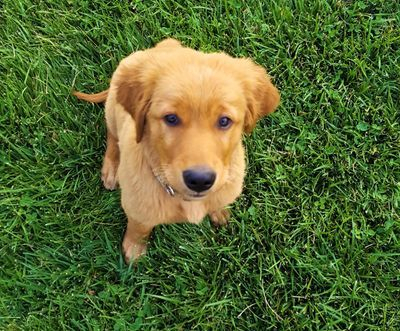 Becket is 11 weeks old and had 4 weeks of basic obedience training from Kim. What a smart and fun little puppy. We are starting on potty training and she is catching on quite well. The whole experience with Kym and her Kennel has been awesome. Weekly updates and a willingness to answer questions when I call. I flew from Wisconsin to see Lish Kennels and was quite impressed. A very authentic, clean and well run operation. I would recommend Kym and Lish Kennels to prospective dog owners!! We picked up our beautiful GSP Letty at 7 weeks old. Letty showed us right away that she is just a natural smarty pants, we had a 10 hour drive to get her home, she only pottied when we stopped and let her out. We also saw her pointing and were playing fetch on her first day home, she has adjusted very well to her new surroundings. Kym was great to work with while we waited for the day we could pick up our girl, sending pictures every week and answering any questions, along with making alternative arrangements with us for the pick up when she was going to be out of town unexpectedly on the day we originally planned. Seeing Lish Kennels in person speaks for itself, everything is clean and well maintained, I would not hesitate to go through Lish Kennels again! I picked up Jersey my GSP a few weeks ago and I am in awe of how intelligent and well behaved of a dog she is! The first day she came home she was already comfortable in her crate, walking on a leash, and could sit and fetch on command. On a daily basis I receive compliments from people claiming they have never seen a puppy this good before! Kym has also been there every step of the way answering any questions I may have. Overall awesome breeder, and spectacular pups! We recently just purchased our male golden. We named him Warden. He is one of Alice and Rusty's offspring. So far the pup has done very well with my family (including my 2 year old boy). I recently started reading for bird and shed hunting. Will definitely purchase another dog from you when the occasion arises. We picked up our German Shorthair Pointer in October of 2013. He has been the most well behaved dog we have ever owned. Not only that, he is amazing companion in our home, and an amazing nose in the field hunting. I could rant and rave about kym and her kennel, but instead I will be referring people who are interested in getting top of the line dogs to her instead :) Best decision ever. Thank you, Kym! I purchased a male wirehaired pointer from Kim in October of this year. We enrolled our puppy "Stache" in her training program for a few weeks before we picked him up. When we picked him up he already new how to sit and retrieve on command. He was also fairly comfortable walking with a leash. Since we've had him at home he has been extremely entertaining!!!! He is very active and has a very social and friendly demeanor with people and other dogs. We are excited to enroll him in more hunting training very soon. It's obvious he already had a great nose for birds! We have some wings that we hide in the yard and he finds them every time! Stache is very smart which makes him a high maintenance dog! He learns quick but also likes to test us. He constantly needs to be reminded who is in charge and scolded when his curiousity takes over!!!! Potty training has also been a challenge but he is progressing well. He is a great eater and is growing so quick!!!! 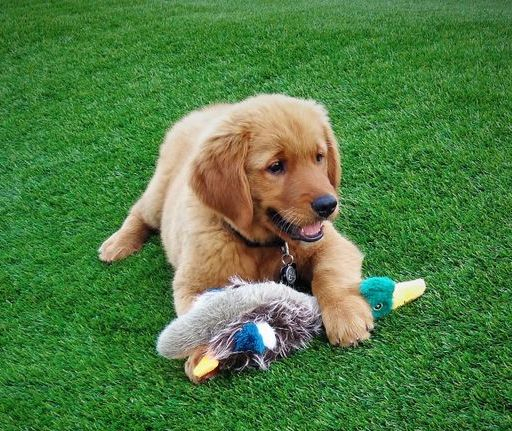 We are so very proud of our newest family member , Dallas a golden retriever puppy! After sadly loosing our ten year old golden to cancer we were determined to find a breeder with healthy bloodlines in hopes of having a longer time with our next precious pooch as 10 years was not long enough. After researching highly reputable breeders, Kym@Lish kennels stood out. She takes great pride in all litters, as she breeds with passion and integrity which certainly showed throughout the entire process! We were kept in the loop via online from pregnancy, birth along with many pictures as well as videos which made us feel like part of the family even before we picked up our bundle of joy!! 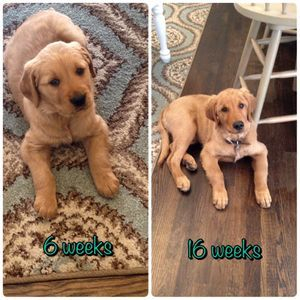 Dallas is growing so fast and he is blossoming everyday! So smart, loving , fun and truly a show stopper wherever we take him! 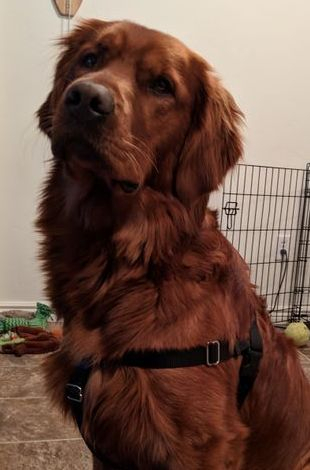 He is a gorgeous golden inside and out! Thank you Kym and your sweet girls for making Dallas the most friendly, loving, playful puppy our family always hope and dreamed for. Topanga arrived just over a week ago to be my partner in Training at the Tom Rose School and my Business partner later for Pet Obedience. So far she is instantly answering to her name, watching my face closely, and following 6 purely verbal commands: Sit, Come (with a sit-front), Speak, "Go to your room" (go in the crate), "Free" which means she can exit the crate, and No! She is an extremely compliant, happy, and confident puppy. There are 15 other students in the course with puppies of their own and she is one of the top two in our class already! I've had to get permission and private training with the Instructors because she's advancing so quickly I have to teach her ahead of the usual program! I couldn't be more satisfied with this bundle of fur, and can hardly believe my luck. Thank you again Kym for doing such an amazing job and for getting this girl in my life! Topanga's happiness is utterly contagious, and her motivation to learn is inspiring. Dasher has fit in perfectly at our house and he is an amazing pup. He has hardly had any accidents (and I was prepared for a bunch!) and the kids argue over who gets to feed, walk, brush or play with him. He loves playing fetch with tennis balls or even his toys (the toy pheasant is his favorite). 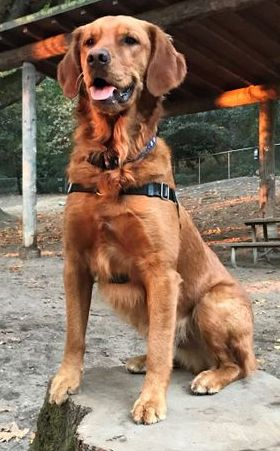 We were so surprised that he already knows how to retrieve the ball and bring it right back and drop it to be throw again. We gave him his first bath in the sink and he sat very still like a perfect little gentleman. Same thing when I tipped his nails for the first time. Everyone who meets him falls instantly in love... And he loves the attention. He will lay in the kids lap and sleep and that makes them so happy. We have also found that having you do the intro training was well worth the expense! He loves his crate and has not had one accident in it. He also listens so well and comes when called. Thank you so much, if we ever decide to add to the family you will be the first one I contact. I highly recommend Lish Kennels, Kym is a professional in every sense of the word. My GSP puppy "Misty" is a wonderful addition to my family. She is proving every day to be the highly intelligent dog I imagined. The week of training that Kym provided prior to me picking Misty up paid huge dividends, a must for new puppy owners. Ender is doing great! He is such a smart dog! We can already tell there is a huge difference between him and the other goldens we have had that aren't specifically bred for hunting. 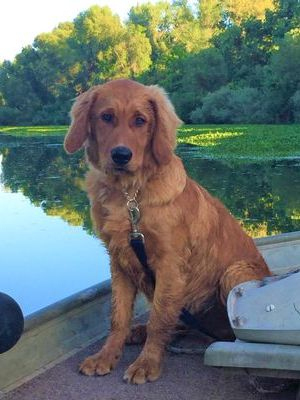 He loves to play fetch, go to the river, and go duck hunting. He loves to goes hunting very frequently. When anyone says the word "bird" his hears perk up and he becomes very attentive. He has to be involved in everything we do. If we plays cards or watch a movie, he likes to lie in our laps. We love him very much! Thank you! We picked up Jaga from the airport a month or so ago and have been absolutely amazed with him since. Even though I was nervous of the flight it was just a day in the park for Jaga. He was so social from the start and came home to our house of two other dogs and 3 children and acted as he has always belonged here. I cant say enough good things about how well Kym has socialized these puppies and how helpful she has been through my many questions. Jaga is extremely focused during our training session and was locking up on pheasant wings within minutes of seeing his first one. I am extremely satisfied with my purchase and can't wait to see the hunter he will turn into. I have purchased a total of 3 puppies from Kym over the years. All of which have been amazing! Kym works with all of her dogs and pups to ensure you are getting the best and most for your money. 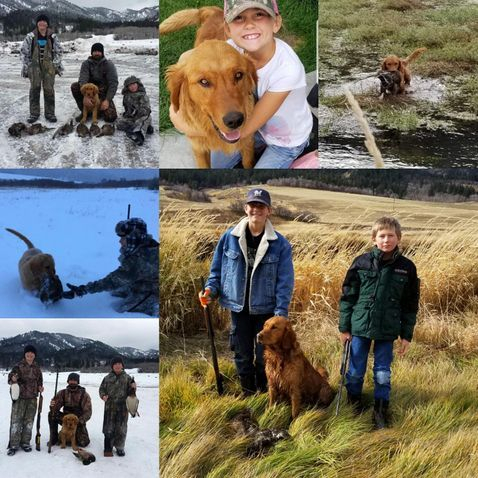 All of our pups from her are amazing hunters as well as family dogs. Our newest addition is only 11 wks old and already hunting the yard. Kym is very honest and easy to work with. I highly recommend her and her pups! I purchased Sage, my Golden Retriever \, June 2013, from Kym Lish, Lish Kennels, and he is just wonderful. He is smart and has a wonderful personality. The professionalism Kym showed us, just made the purchase of Sage more enjoyable than we ever could have imagined. She still helps, even after the sale, to answer any questions I may have. You can't go wrong acquiring a puppy from Kym. Sage is a lot of fun and I would recommend anyone to contact Kym for your Golden!! We have had Sage now for just over two months now. What a great pup. We cannot say enough good things about Kym and how she works with these pups before they come home with you. I cannot decide if I am more impressed with how smart our girl is or how great her hunting instinct and nose are. I would recommend Lish Kennels highly. Kate is an amazing dog here she is getting some bird training. Kate is a fast learner. Doing good on come, whoa, and kennel. She has a great nose. I'm glad me and my son made the two day drive we just love her!! Kym, I just want to say thank you for the opportunity to be able to purchase Daisy. We are very great full. Watching her everyday I can see she has amazing potential to become a field champion. 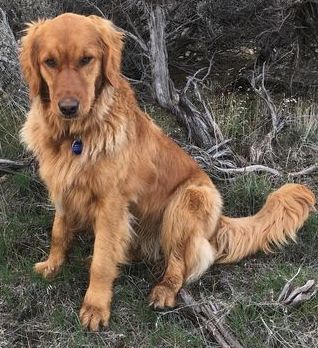 Daisy is extremely smart and has a very good temperament we can tell that she was started the right way she loves our kids and really enjoys playing with my 1year old daughter. Daisy has already pointed quail and two big roosters, being only 3 months old and with very little training from me shows that she has an amazing bird drive. We just wanted to say thank you and will keep posting pics on Facebook for you. Lish Kennels is easily my highest recommendation for anybody looking for a German Shorthaired Pointer. Kym was absolutely wonderful to work with and is always willing to answer any training questions I have. I picked up Ace the day before he turned 8 weeks old and I have been impressed since day 1. He is the fastest learning puppy I have ever had and already has a natural drive for birds. He loves learning and exploring and already has an unbelievable nose on him! I can't wait to see what he will do in the future. Thank you Kym and Lish Kennels for everything! I bought BiBi back in the fall of 2011 while I was deployed to Iraq. Not many people believe me when I said I picked her out of a photo because of how great of a dog she is. She is so sweet and bird crazy. I dont know what I would do without her. She is by far the best companion/huntin partner I have ever had. 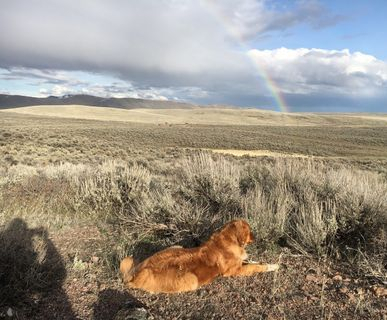 After losing our 12 year old golden Abby, we thought we would never experience the joy and fulfillment she brought us. We were wrong! We phoned Lish Kennels and they had one puppy left. When we arrived to meet our new puppy we fell in love. She was wearing a purple diamond studded collar, and thats when she became our Lucy in the sky with diamonds. Our experience with Lish Kennels has brought back the joy and happiness to our family. We met and picked out our Athena when she was 5 weeks old and brought her home at 7 weeks. That was one week ago. It was a 5 hour drive to get her home, we had food breaks and potty breaks, and she did amazing. Already she is kennel trained at night and almost trained during the day. And we can check potty training off the list, she knows to go to the back door when it is time. She is the smartest puppy I have had the pleasure of having join our family. She came very well socialized and had no problem adjusting to our family. She is the love of our lives. Kym sent us weekly pictures, gave us some start up training advice, and will answer any questions we have. She was excellent to us and our Golden Retriever Athena. I would highly recommend Lish Kennels! I purchased a puppy from Lish Kennels. Our pup is an absolute pleasure and a great addition to our family. She came well socialized and was not timid of our three year old, infact, they hit it off the quickest! And now the two are nearly inseperatable. 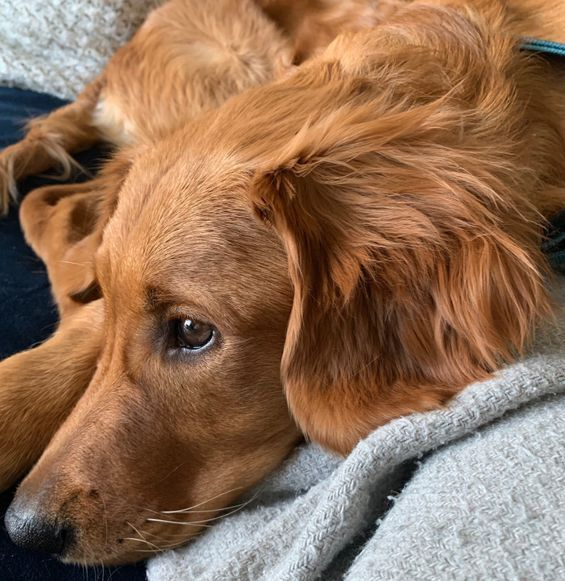 Kym gave us training tips from day one including, how to crate train the pup, to start her obedience, and field training. She has always been just a phone call away and I have called her on more than one occassion with my questions. I couldn't of asked for a better dog or a better breeder, Thank You Lish Kennels. Thank you Kym! Goldie is coming along swiftly! She is already housebroke. We have been advancing through her field training with ease. She is so happy to please and loves her training sessions. We are so very pleased with our choice and look forward to another pup from you in the future! Our little girl is doing outstanding! She's already retrievers little tennis balls and puppy bumpers. We have kennel training checked off the list, and almost have potty training off as well. As you can see she's already made herself at home on our sofa! She has an appointment this Saturday for her second round of shots. Thank you all again for your help! I bought a GSP stud from Lish Kennels, Kim was nice to deal with and the dog turned out to be even better than expected. Kim is straight forward with info about her dogs. I have been very happy with the purchase. Lish Kennels is AWESOME! Kym has been helpful from our first phone call to her inquiring about her litter of German Shorthairs. We were able to visit and pick out Greta at 6 weeks old. The property and kennels were impressive and the puppies were so stinking cute and healthy we almost picked out two. Because of an existing vacation plan we were not able to pick up Greta til 9 weeks.... and Kym was there for us.... On the 4th of July for us to pick her up. It's been true love every since. Greta is beyond a beautiful and healthy dog. We have since called on Kym for advice in training Greta and she has been so helpful and supportive. That really meant a lot to us. I can not thank her enough. Lish Kennels come very highly recommended form us and we look forward to another puppy from Kym..... Greta has brought us so much joy- We can not thank Kym and Lish Kennels enough. I had the opportunity to tour Lish Kennels and their facility with Kymberly. They have a nice set up with birds on site. My pup from the kennel came well socialized, had been introduced to bird wing at early age, well cared for. We were able to get just what we wanted and are thankful we were referred to Lish Kennels. We have a pup from the last litter. She is a wonderful dog ,very eager to please and has already won a blue ribbon for her first level of obedience. We had her shipped to Canada and Kymberly was so helpful. Would buy a pup again from Lish Kennels! We had a wonderful experience with Lish Kennels. All information provided was very straight forward and the puppy we received was obviously very well cared for. We couldn't be happier with our experience and our choice of puppy. Our puppy arrived via plane ride well socialized, healthy, happy and beautiful. We would higly recommend Lish Kennels and would use them again in the future. Our puppy is beautiful and healthy. Her markings and ticking is gorgeous. We get comments on Daisy everywhere we go. Kym was great to work with and you can tell that she takes good care of the pups. We recommend Lish Kennels highly to anyone who is looking for a GSP pup. Thank you, Kym. We love Daisy! We bought our puppy from Lish Kennels and could not be happier with our choice. He came well socialized, happy, and healthy. Our vet is also very impressed with our pup. She noted that the pup was well cared for and excellent quality. Kym Lish was great to forward us pictures and answering our questions. We will definitely be recommending Lish Kennels. We got our little Zeke from Kym at Lish Kennels. He adjusted so quickly to the transition to our home that you would have thought he had lived here since birth. I attribute that to how the puppies got their start with Kym. He came to us socialized, independent, and secure. 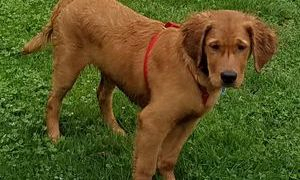 Zeke is independent and confident, traits that my husband looks for when selecting a puppy for a good hunting companion. He's also very interested in the quail, doves, and song birds that frequent our yard. For me, he has all the traits I look for in a family pet: social, snuggly, cuddly, and cute. His markings are striking, making for a really handsome boy! Although he's an independent little guy, he likes nothing better than to be snuggled up on your lap. And to top it off, he's smart as a whip. His early training has gone really well with him learning very quickly. We're thrilled with the new addition to our family.